Over the past twenty years, the burgeoning field of Animal Studies has re-oriented contemporary philosophy and critical theory towards the question of the human and its others. Scholars like Matthew Calarco have demonstrated just how deeply a preoccupation with the animal runs through the work of Nietzsche, Heidegger, Levinas, Agamben, Deleuze, and Derrida, to say nothing of their antecedents in the West and their contemporaries in the Global South. Much of this animal studies and “posthumanist” scholarship has been either historical or phenomenological, aimed at excavating the human-animal distinction’s extensive past or discerning its effects in contemporary political, social, and psychic life. Recently, an emerging body of scholarship has begun to chart the topographies of the future and the animals that will—or won’t—reside there. This scholarship has profound social, political, and theoretical implications, given recent advances in animal biology and neuroscience, continuing struggles over who counts as fully human and which lives matter, and—looming over everything—the apocalyptic threat of climate change. Over the course of the 2015-16 academic year, the Animal Futures Working Group will explore this new terrain in dialogue with a number of distinguished scholars from Berkeley and further afield. The goal will be to work collaboratively, creatively, and speculatively on the future and the forms of life it might sustain. Sessions begin Thursday, September 24 and are open to the public. Meetings feature conversations on assigned readings and presentations by guest speakers including UC Berkeley Professors Donna Jones, Mel Chen, and Charis Thompson, as well as Tobias Menely (UC Davis), Alexander Weheliye (Northwestern University), and Zakiyyah Iman Jackson (George Mason University). To register for working group sessions and to receive readings, please contact critical_theory@berkeley.edu. Animal Futures Working Group is supported by The Program in Critical Theory and organized by UC Berkeley graduate student Joshua Williams (Ph.D. Candidate, Performance Studies; DE in Critical Theory). Sessions begin at 5:30 pm and take place at BCNM Commons, 340 Moffitt Library, UC Berkeley unless otherwise noted. All events are free and open to the public. In this session, Joshua Williams explores a recent groundswell in North American and European visual and performance art that attempts to rehabilitate and repurpose the universalist scopic regime of nineteenth and early-twentieth-century natural history. The project of these new naturalist artists is not to ritually declaim their own animality, as others have in the past, but rather to hold their fellow animals at a distance in order to disclaim their own entanglement in hegemonic structures of taxonomy and control. Only by retracing the itineraries of the old naturalism can their vision of new and liberatory naturalism be realized. What are the stakes of this project? What politics are entailed in remapping the animal world when life itself seems more precarious then ever? What future(s) do animals have in and beyond life? In this session, Professor Donna Jones presents her reading of time and the technologization of animal being in Ridley Scott’s landmark 1982 film Blade Runner before opening the conversation up to broader posthumanist questions. 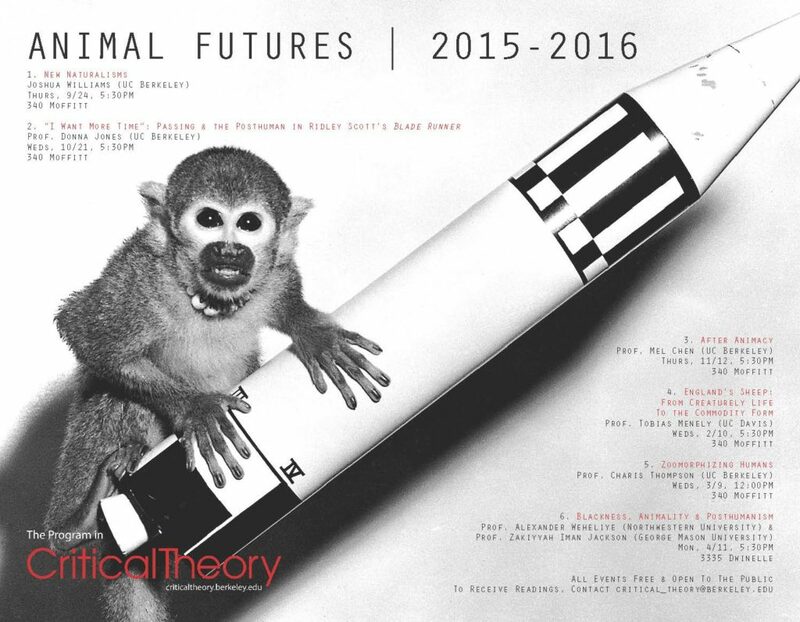 This is also an opportunity to examine one of the most persistent modes of thinking about futurity: the speculative. How have our speculative fictions about human and animal being—and human and animal politics—helped to inaugurate our world? Mel Chen’s path-breaking 2012 book Animacies: Biopolitics, Racial Mattering, and Queer Affect opened up entirely new fields of inquiry at the intersection of queer theory, animal studies, critical race theory, and new materialisms. In this session, we explore the line of thinking leading from animacy towards Professor Chen’s more recent research on the materialities of “constitution” and the co-imbrication of race and disability. What do ideas of animacy—and animality—tell us about human vulnerability and the futures our politics make for us? In this session, Tobias Menely focuses on modes of ovine representation in eighteenth-century England as sheep acquired increasing prominence in international trade. What happens if we locate domesticated animals in Marx’s famous account of the commodity form? What kind of commodity is an animal? What might the commodity form tell us about the status of animals under industrial agri-business and international trade? One potential implication of this emphasis on the commodity form will be to put some pressure on the biopolitical model increasingly appropriated in animal studies, to map a break whereby the exemplary pastoral species comes to be an exemplary object of capitalist exchange. Many believe that there is something wrong with anthropomorphizing animals. What exactly is wrong with it, for whom, and do the same problems hold—or not—when we zoomorphize humans? In this session, Professor Charis Thompson will addresses these questions through her work on elephants, bioterrorism, and the animal model in the life sciences. This is an opportunity to return to a set of questions that has preoccupied animal studies scholarship for decades: what exactly is the boundary between human and non-human animal life, and what does the varied terrain this boundary traverses tell us about our common future? In this final session, Alexander Weheliye and Zakiyyah Iman Jackson share some of their recent work on the often fraught intersection of blackness, animality and posthumanism. Are animality and the posthuman registers of being to which black struggle has—or should have—recourse? Or is the idea of the posthuman, not unlike the human itself, hopelessly foreclosed by a history of denigration that has sought to relegate black life to sub- and non-human status? What can close attention to these political and theoretical questions tell us about the future and the possibility of liberation?